This was one of my last portrait sessions in New Jersy before relocating to Charlotte, and it couldn't have been better. I had worked with this client twice before, and she wanted to ensure we had one last session before my move. Just like our last session, which was held at the beach, the forecast for the day was supposed to be sunny, but changed on the morning of the session to be rainy during our afternoon time slot. It was going to be a game time decision. We initially decided on a location that was an hour from our homes. But as the session time grew closer, I could tell that we wouldn't make it there in time before the rain. But there was a gap in the radar just south of our location, and I was lucky enough to photograph at a park nearby just the day before. And so, being flexible, we adjusted our plans and start time and met at our new location, and we got lucky with one solid hour of pure sunshine! And about 10 minutes into my drive home, torrential rain. So, how do you get an adorable image like this one? 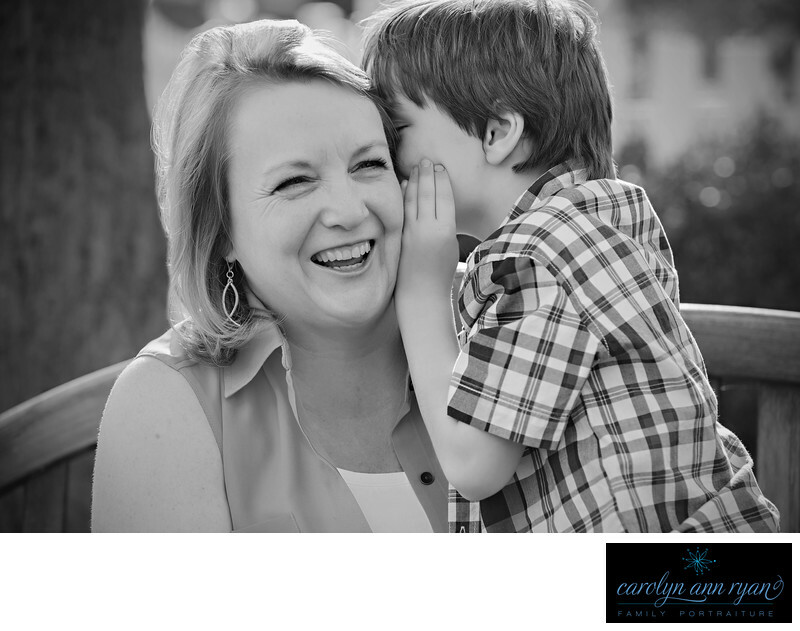 Just ask the little guy to tell his Mommy a secret, except in this case, he started to lick her ear and she couldn't stop laughing. Perfection. This photographed received a Silver Award in the Wedding and Portrait Photographers International (WPPI) Second Half 2015 Image Competition.Keywords: b&w (51), bench (6), black and white (54), Charlotte NC (180), Family (171), giggles (105), Mother and son (15), plaid (105), secrets (3), Summer (69). 1/250; f/4.0; ISO 100; 105.0 mm.